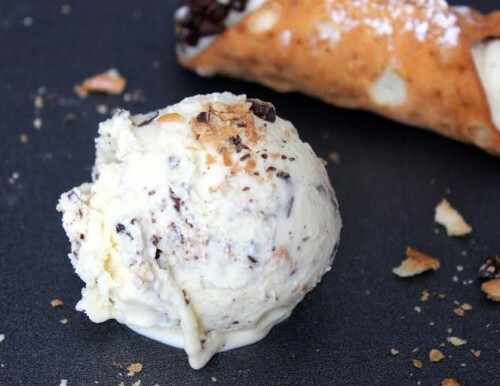 We get pretty excited about unusual ice cream flavors here at ES, so we were stoked when we found out about “100 Scoopies,” a project to make 100 unique ice cream flavors in 365 days. From Sriracha chip to stroopwafel and and limburgse vlaai, Bostonite Chloe Jankowitz has been churning out innovative flavor after flavor, winter weather be damned. She was also kind enough to share one of her most delectable recipes with Endless Simmer. I”ve always loved quiche. Something about the cheesy, creamy, gooey and savory pie-like meal just keeps me coming back for more. 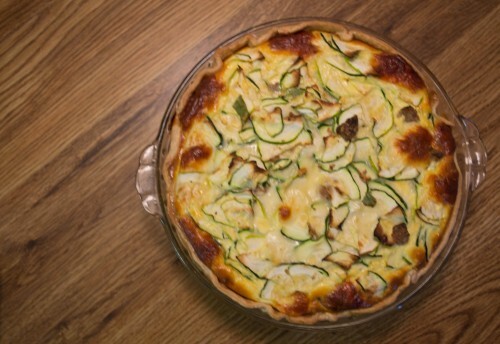 Well, apparently I did not know just how good quiche is until my Italian girlfriend cooked up my new favorite: zucchini and meatball quiche. When the idea was first mentioned to me, I was skeptical. Zucchini is not my favorite. 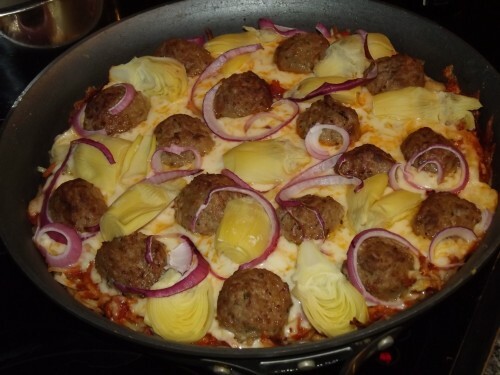 It”s never something I crave or think “hmm, that sounds good!” Well, turns out, “the Italian” was on to something. I”m hooked and it is one of my frequent requests. I was torn. Was it right to go from one to the other, day after day, year after year without paying a price for my indecision? But how could I choose? I loved them both so much. If only there was some way that I could combine the delicious comfort of my hot little Neapolitan delight with the classic, saucy, international flare of my first love. But if I could, what would people think when they discovered that I’ve forced my two great loves to unite in front of me so that I might enjoy their desires at the same time? Would it be moral? Would it be proper? Could it ever really work?…. Aaah, the hell with it! Let’s do this thang! In a family with two working parents and a rambunctious two-year-old, I only have a few priorities when it comes to weeknight cooking. I need something relatively simple, something relatively nutritious and something relatively delicious. All three are probably a step down from how things were in the past, but I’m OK with that. How simple? I’d really like it if my knife prep was the most time-consuming aspect of the meal. We’ve been doing a better job with nutrition by cutting out a bit of meat from our diet and focusing on more vegetables. And I don’t think it’s too much to ask that my pasta sauce taste better than Prego. So when I thought about how I could bring some of the slow-cooked goodness of bolognese to a Tuesday night, I decided to swap out the meat for mushrooms and see how I can amp up the flavor a bit. The keys were to get a good caramelization using vegetables that didn’t take too long to break down (mushrooms, shallots, garlic), liberal use of tomato paste and a good dash of Worcestershire sauce for some sweetness and anchovy flavor. The result was a richly flavorful sauce that nicely coated the noodles but didn’t weigh it down. Your diners might not accuse you of spending all day in the kitchen, but if I can get something this good and still have time to watch some Pajanimals with my kid, I’ll take it. So it’s the second day after Christmas and I’m in my local grocery store when what do I see? 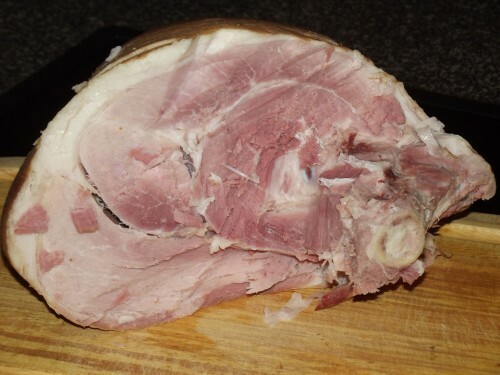 All of the leftover hams that weight ten pounds or more are marked down to 99 cents a pound! Am I interested? Heck to the yeah! I grab two and make a mad dash for the checkout counter and before you know it I’m stuffing my bundles of pig joy into the freezer next to my emergency vodka. Sweet! Fast forward to yesterday, when I’m wondering what to do for dinner and I suddenly remember my major swine score. So I thaw out contestant number one and pop it in the oven next to some scallop potatoes that I threw together. About 40 minutes later–voila! I sit down to enjoy my dirt-cheap ham dinner feast. It was so good I couldn’t wait to fire up a ham-steak-and-egg breakfast this morning. Then a few hours later I treated myself to a lunch consisting of a cold ham sandwich with mustard and Swiss cheese. Now I’m getting ready to make my dinner when what do I see staring back at me from inside my fridge? That goddamn ham! About eight and a half pounds worth. What was I thinking? Deal schmeal! This feels more like a sentence—and there’s no time off for good behavior. I’m now deep into day two of all things ham and it’s déjà vu all over again. Originating in Sicily and often coined “rice balls” in Italian-American eateries, arancini are the ultimate crispy, melty snack. 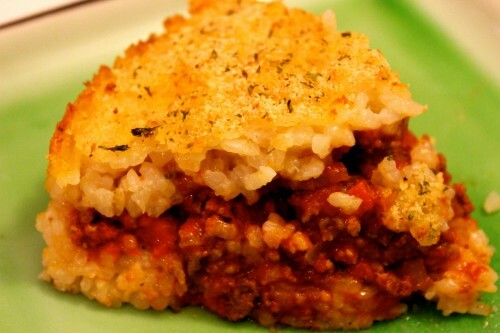 The tennis ball-sized spheres of risotto are filled with ground meat and cheese, coated in breadcrumbs, deep-fried and served atop a pool of marinara sauce. The name is derived from the shape and color which is reminiscent of an orange, “arancia” in Italian. While arancini are incredibly enjoyable as snacks, we decided to revamp the traditional, crunchy cheesy orbs and transform them into a savory tart. Our Arancini Tart is an elegant auburn display that when sliced, reveals a decadent ragu–an impressive entree at any dinner party. Has anyone else missed Fabio Viviani? I know I’d take his crazy Italian ramblings over this year’s boring Top Chef-testants any day. Well, not to worry—I just stumbled upon his new web series, in which Fabio and his disturbingly hot mom cook up drunken red spaghetti—pasta doused in red wine and smothered in pecornio, walnuts and caramelized pancetta. I love this dish because he doesn’t add just a little bit of booze. Uh-uh. He adds enough wine to turn those noodles purple! Now that’s Italian. 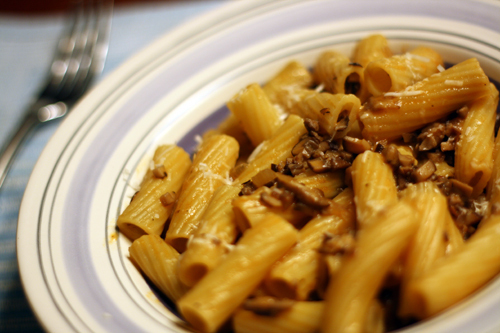 Also – check out his nickle-and-dime pasta serving size trick at 2:40!